This could be my first attempt that I managed to make an exquisite Cake for Chirstmas. Torte is a cake made with many eggs and it is usually layered. I got this recipe from 'ZoeBakes'.I was so fascinated on seeing her cake and I wanted to give it a shot.I couldn't make it as adorable as she did.But the way she expalined was so simple that anybody could reproduce the recipe.It took me almost half a day for me to finish making this cake.In the end ,its all worth it.All thanks to Zoe.. This is some kind of cake which I never tried from our town bakeries. I wouldn't say this is a successful one.But it doesn't tasted bad and I have to agree upon the fact that it is definitely different from the original recipe in terms of look and taste. There are many factors for the variations.Firstly,I couldn't get all the ingredients actually required to make this cake.This recipe called for fresh strawberries.I replaced it with Strawberry Crush.And I did inumerable mistakes.Instead of baking the dacquoise in lower temp setting,I did that in high temp to quicken the process.Eventually,it turned out over browned and sticked to the wax paper.I took hell a lot of time to paitently remove the baked dacqouise from the wax paper.The cake came out perfectly.I patted myself for that.I adored the lovely orange tinted cake for a while before icing it. I must admit ,Im awful in doing the icing part.I became so impatient and just spreaded it over the cake. Inspite of that,it did tasted good.Everybody at my home loved it.But I must learn to make it perfect next time and should concentrate on minute details. I beated the egg white for soft peaks.Added sugar and beated for a couple of mins until I get the glossy appearance. Added the coarsely ground Cashews and folded it with the beaten egg whites. I spread the mixture in a circular motion on a wax paper. I baked in a preheated oven until they are cripsy.One should take care not to over brown it.Unlike me ,make sure to bake it in a lower temp like 110 C for about an hour. 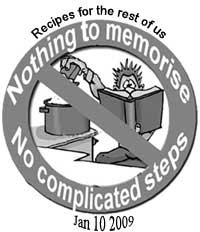 Sift the flour and salt and keep aside. In a clean bowl,I beated the egg white using electric whisker with 1/2 cup of sugar until soft peaks. In another bowl,I beated the yolks by gradually adding sugar.I continued beating until it is thickened and smooth. (Make sure that you wash and dry clean the whisker). I poured the orange juice and zest and blended it well. Then I Added the flour to the yolk mixture and folded well. As Zoe mentioned,I folded the egg whites to the yolk/flour mixture in portions. Lined a baking tin with parchment paper and poured the batter in it allowing some depth for the cake to rise.Baked the cake in a preheated oven of 250 C for 30 mins. I sliced the cake horizontaly into 2 portions. 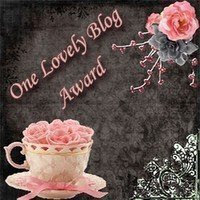 I made the Strawberry Cream by combining 3 tbsps of Strawberry Crush with thick fresh cream. I spreaded some strawberry preserve over the bottom layer of the cake.And I crumbled the 'supposed to be Dacqouise' above it. Spreaded half of the strawberry Cream on it. Then I placed the other half of the cake above it.And spreaded the strawberry preserve on top of it.Spreaded the remaining strawberry cream.Its done! Chirstmas joy is already set and all the bakeries in our town are in full swing in creating Chirstmas cakes and pastries.Few days back,I made these lovely muffins with over ripe banana and apple sauce and then I felt i would never need to go to bakery again to buy the usual tutty-fruity muffins. We had some guests last week and so got lots of apples.So i decided to make applesauce with them and preserved it in jars and refrigirated it.. 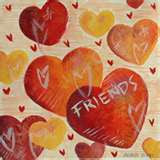 I used Fuji apples which is neither too sweet nor too sour.Granny smith apples are not prefered for making applesauce. Wash them and slice it with a apple slicer/corer. Take 1 inch depth of water in a heavy cooking vessel.Put the sliced apples and bring the water to boil.Simmer the apples covered until they become soft.This takes about 30 mins. Cool and puree the cooked apples in a blender to a smooth paste. 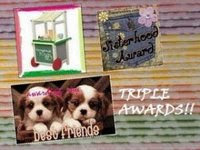 Preserve them in clean ,dry jars.This can be refrigirated and can be used for upto 3 months. 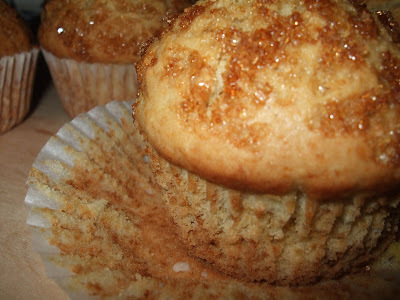 Applesauce is ready.I was searching for some recipes which could use applesauce.Then i came across this delectable muffins which also helps me clearing off the untouched,over-ripe bananas..
Seive together flour,salt,cinnamon powder ,baking powder and soda to get it free of lumps . 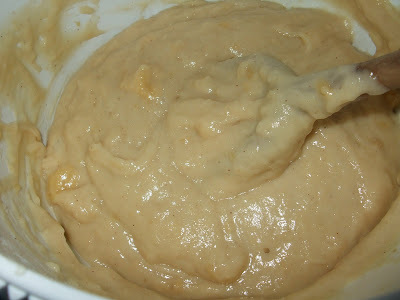 In a seperate bowl,beat eggs and sugar.Add the mashed banana,applesauce and vegetable oil and mix well. Add the dry flour mixture to the wet mixture and mix well with a wooden spatula. 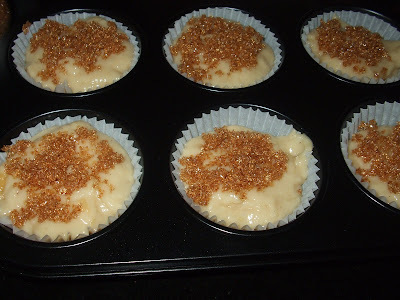 Place muffin liners in each cup of the muffin tray and fill the 3/4th of each cup with the batter.Sprinkle some demerera sugar.Pop this in 250 C preheated oven and bake it for 20 mins. I m so pleased with the beautifully risen muffins.They were spongy and the demerera sugar sprinkled on the top of the muffin made a great difference! 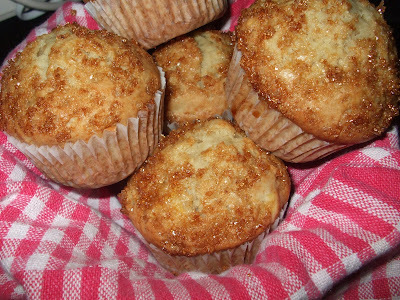 These muffins can make for a perfect breakfast. Its Chirstmas time and so I thought of sharing with you all some of my baking delights.Today I accidently came across my childhood Cookery book ,'ABC cookery'.This book has simple recipes which children could make with some assitance.Im so excited when I read about this 'Quick Muffins' recipe.It just requires 2 ingredients and 20 mins of baking time.Thats it..you get super spongy,flavorful muffins. The flavour and sweetness is already in the ice cream.So we don't have to reach out for Sugar or Vanilla extract.This is something incredibly quick and simple..isnt it? We just need to bring the ice cream to room temp.And mix it well with the flour. Take a muffin tin.And place a muffin liner in each cup..Drop the muffin batter in each cup giving some space for the muffin to rise. Bake the muffins in a 250 C preheated oven for 20 mins. Squirt some honey or chocolate syrup on each muffin. Wash and soak the rice flakes in water..
Heat oil in a Kadai.Add the mustard seeds and cumin seeds.Allow it to splutter. Add the onion,chillies,turmeric powder and salt.Saute until the onions get transculent. Drain the water and squeeze out excess water from the soaking poha.Its enough to soak it for 5 mins.Add the poha to the onion mixture.And stir well. 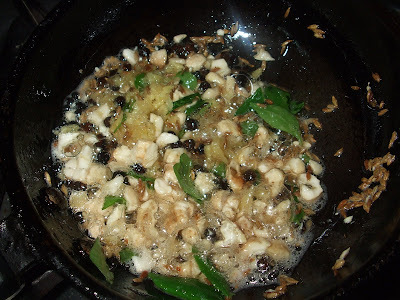 Turn off the heat and add lime juice ,chopped coriander and roasted peanuts.Toss well and serve. We had this with crispy 'wheel' vadams. 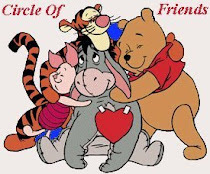 Don't you think those purple bits of onion in the yellow poha is adorable??? 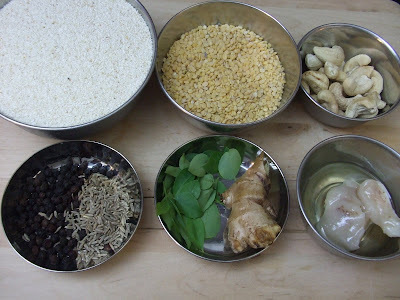 Sending this to Recipes for rest of us event hosted by Ramki of One Page Cookbooks. 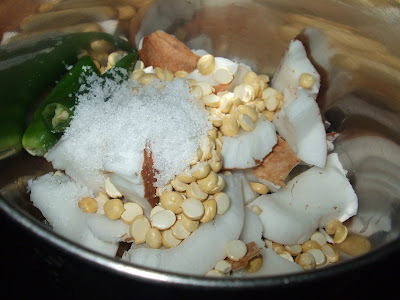 Karthigai Deepam,Rawa Pongal and Coconut Chutney ! Today is the festival of lights-Karthigai Deepa Thirunaal.It is predominantly celebrated in Tamil Nadu for the auspicous star Kirthigai's ascension.Like others,we too lit many little beautiful lamps in the clay diyas,which we lined on our compound walls and decorated the lovely 'Kolams' with diyas.We made a pooja with the lip-smacking 'Pori Urundais'(Puffed Rice Ladoos) . 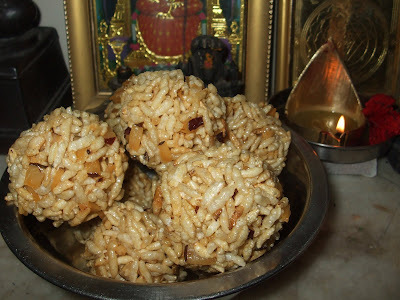 In some homes,it is in practice to make 'Kothumai(Wheat) Appam ,Ulundhu(Urad Dal) Vadai and Kadalai Urundai'(Peanut Ladoos).But we usually celebrate Karthigai with just Pori Urundais.The tiny bits of coconut is what I love the most about Pori Urundais.As my grandma is away and my mom is busy, my mom's sister made these urundais for this Karthigai and sent us some.It was the one of the perfect Pori Urundais which I can't stop eating .They were in good shape and I wanted to capture the beauty of these lovely delicacy.I never tried making this,someday I have to ! I felt a pang deep in my heart that,I didn't made anything for this Karthigai.So to overcome the grief ,I declared to my family members that I will make the dinner. 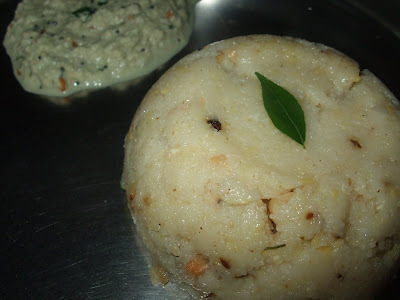 I made 'Rawa Pongal' and 'Coconut Chutney'.Its very simple and comforting.We always use rice to make Pongal.But Rawa Pongal is quicker to prepare and also tastes like restaurant pongal. 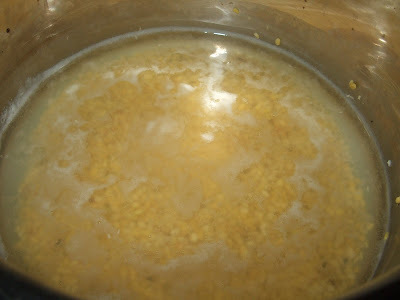 Wash the dal and boil the dal in 1 1/2 cups of water.To make this boiling process quicker you can pressure cook it. The dal must be well cooked as shown in the picture.Boil 4 cups of water.Add salt and 1 tbsp of ghee to the boiling water.Stir and pour the boiling water over the dal.Add the semolina and stir it constantly.Keep the heat in low. 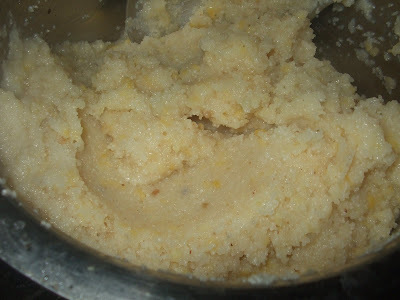 The semolina will absorb all the moisture.And the pongal will look like this. For the tempering,heat 2 tbsp of oil and add pepper,cumin seeds ,ginger,curry leaves,cashews and fry until they are roasted well. 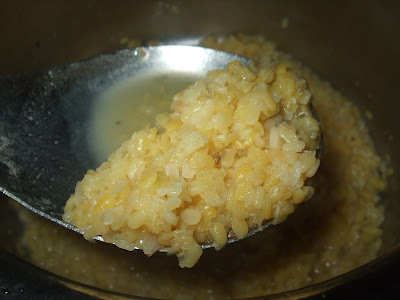 Throw this over the pongal and stir well.Add the remaining ghee and serve. Put all the ingredients in a mixer,add 1/4 cup of water and grind to a smooth paste. 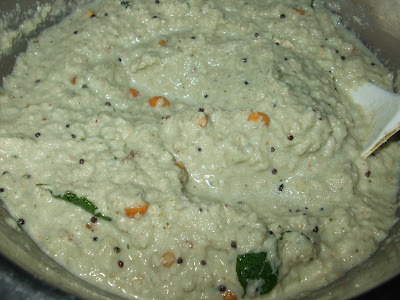 Heat oil,add all the ingredients of tempering one by one and when the seeds splutter.Pour it over the Coconut Chutney with the oil.Stir and serve. When I started to learn cooking during my school days,I often try to create dishes that uses bread.Chilly bread is my first loved-by-all recipe.Every friend of mine loves this dish.Each weekend they ask me to make this for them.Its very easy and could be prepared in less than 15 mins.And I bet ,you can't stop eating this.This is such a crowd pleaser and one can make them in large amount and include it as starter in parties.. I made this innumerous time and it never failed me once.What Im going to show u now is my own style of making Chilly Bread.One can make it with whatever variations they want. Cut the bread slices to 1 inch cubes.Heat 1 tablespoon oil in a large frying pan.Add the bread cubes and toss them.They must get light brown in color and bit crispy. In the same frying pan,heat 2 tablespoon of oil and add the onions and chilly.Fry for a couple of mins.Add the tomatoes and ginger-garlic paste and fry for another couple of mins. Add the turmeric,chilly power and garam masala.Add required salt.Give it a nice stir.Cover and cook for 3-4 mins. Add the Ketchup and mix well.Make sure that its not too saucey.Otherwise the bread may get soggy.Add the fried bread chunks and toss to get it all coated with the tomato-onion masala. Garnish with coriander leaves and serve!